This slim volume is about the less known younger brother of Paramacharya. Sri Sadasivam, Sivan Sir as he was affectionately addressed, was a siddhapurusha, who captivated the hearts of a close-knit group of followers. Sri Sivan Sir abstained from water – neither bathed nor drank a drop for years. (How can fire and water co-exist? he would laugh). He ate sparsely or not at all. Led the life of a mendicant, travelling most of the time and taking shelter in devotees’ (Padma Subrahmaniam was one of them) houses. Tiruvenkadu was his favourite halt. He indicated the passing of Paramacharya (Waking from meditation at dawn, he uttered, “The world is losing a noble soul.” The day was January 8, 1994). Sivan Sir shed his mortal coil in 1996. 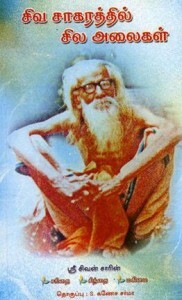 Siva Saagarathil Sila Alaigal – S. Ganesa Sarma – Publisher G. Sivaraman, E-Block, Second Floor, Flat No. 1, Sri Jayendra Colony, Old Mahabalipuram Road, Kandan Chavadi, Chennai – 96. Phone 9600015230. Also contact 9443678057 and 9940552516 – Rs. 40. Very fine article , every human being must to read. My humble pranaams at the alotus feet of both Mahans. l have been following Maha periava puranams in the blog. l would be greatly indebted if any kind soul can translate all the experiences into English and come up with a book. This will greatly benefit the Hindus in Malaysia and other countries who are unable to read Tamil(sad to say ). ls there any Ashram for Maha Periava in Malaysia?